The Examiner was started by a group of Adelaide gentlemen when Nathaniel Haile's Adelaide independent ceased. It was owned and printed by the Independent's former printer, George Dehane. The newspaper saw itself as a (very vocal) opposition to Dehane's former employer, the South AustralianRegister and claimed to be the, "only liberal portion of the press" in Adelaide at that time. (18 August 1842, p. 2) Richard Penny ('Vox Populi') was the outspoken editor, assisted by fellow doctors Litchfield, and Edward Davy. The newspaper was unable to survive beyond eighteen months, and its presses were absorbed into the new Adelaide Observer. 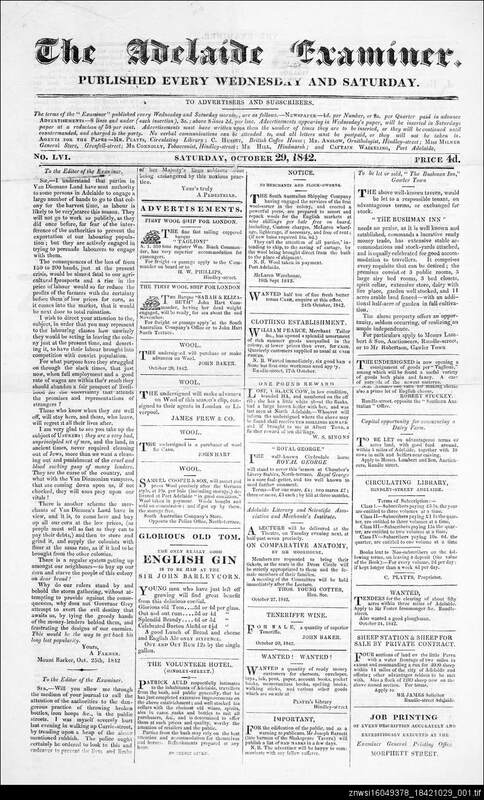 While it lasted, the twice-weekly newspaper published many strong opinions about a range of topics and protagonists in early Adelaide, providing a fascinating alternative press commentary. Topics The European colony was only five years old when the Examiner began. The 1840s were a difficult time, as the colony entered a financial crisis following over spending and drawing on credit reserves. Governor George Grey bore the brunt of criticism for this situation. This is the background context to much of the Adelaide examiner's content. An early issue contains a pessimistic article titled, 'How shall we live?' - mostly criticising the Governor. (25 December 1841, p. 2) Early issues also contained regular articles about farming and agriculture, in response to many settlers attempting to begin farming in the new colony without any prior experience. Theatre Regular advertisements for the Queen's Theatre appear in the Examiner, as well as occasional reviews of plays. Closure The prolonged economic downturn, together with the competition of the longer-running newspapers, probably caused the Examiner's closure. An arrangement was made to sell the printing equipment to John Stephens - who the newspaper had previously deplored working with James Allen at the Register (8 April 1843, p. 2, 3) - and Stephens established the successful Adelaide observer.